I have received several emails from bird hunters asking of my opinion on certain bird dog immunizations including the Rattlesnake vaccine by Red Rock Biologics. 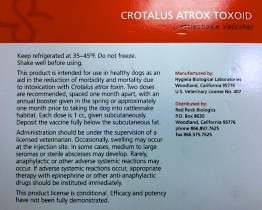 I have not vaccinated my dogs with this vaccine because of the USDA conditional license status this vaccine carries (If you read the bottom line on the photo which reads, “This product license is conditional. Efficacy and potency have NOT been fully demonstrated.”). I think the concept is great, but I’d need to see numerous cases/studies that proved the mettle of this vaccine before I’d inoculate my partners with it. This brings me to the point of free thinking…before running out to get the latest H1N1 (or whatever other vaccine…medicine…food…product…etc) immunization for ourselves…think about the motivation behind the product! It’s a gazillion dollar industry!!!!!! Furthermore…find a veterinarian who truly understands bird dogs and is open to freethinking and questioning! Ask loads of questions. I’m off the soapbox…4 more months ’til grouse season! Biological agents are regulated by USDA, not FDA, and thus are not subject to FDA regulations that address extra label use. It is generally recommended to follow label instructions, however, in most cases veterinarians may legally use vaccines in a discretionary manner if medically justified and in compliance with State/Federal restrictions that apply. USDA licensing at the full approval level provides a baseline standard for efficacy, safety, purity, and potency, but the clinical need (relevancy) or usefulness (applicability) of a product may not be completely assured by the licensing process. In some instances, the number of animals used in pre-license safety testing might be inadequate to identify rare but relevant safety concerns. In other instances, product efficacy and/or safety can be impacted by the use of concurrent therapeutic approaches that may not be cited as a contraindication or warning on the product label. The USDA must approve labels for biological products. However, current labels frequently contain revaccination interval recommendations based on historical precedence and acceptance rather than specific duration of immunity data; consequently, some product labels may fail to adequately inform practitioners about optimal revaccination and long-term use of a product. Newer products and some older products with updated labels have revaccination recommendations based on data on file with USDA. Labels on licensed vaccines make different claims and should be carefully studied when evaluating products. Claims may, for example, declare the product (a) prevents infection, (b) prevents disease, (c) aids in disease prevention, (d) aids in disease control (reduce disease severity, duration, and/or onset), or (e) other (control of infectiousness through reduction of pathogen colonization and/or shedding in animals). Each of these claims represents a different level of performance outcome that might be important in selection of a specific vaccine. USDA approved products, under conditional licensure, have demonstrated host-animal safety and a reasonable expectation of efficacy. Autogenous vaccine regulations do not require confirmation of 1) efficacy, 2) potency correlated to efficacy; or 3) host-animal safety to the USDA prior to product licensure and use. Good post, doc, and one that is very relevant to me. While I don’t profess to have the credentials or experience that you do, I am choosing to have my young and rangy pointer vaccinated. Here’s how I came to my decision. Being on the far eastern edge of rattlesnake country (KC), my vet knew nothing of the vaccine. And yes, he’s a well-qualified Kansas State educated vet with a good knowledge of bird dogs. In fact, I couldn’t find a vet in the KC area that was knowledgeable about the vaccine — nor could I find one that even stocked it. I attributed that to geography, not efficacy of the vaccine. I’ve done my research on the web (which we both know is always 100 percent accurate), yet I couldn’t find any credible vet or sporting dog owner that cited any harm to their canine companions other than temporary swelling at the injection site. Furthermore, I guess I just don’t trust the FDA or USDA to tell me what’s safe. I’ve worked on cases involving oxycontin and e.coli, and I know firsthand that the government doesn’t always have our interests at heart. But the thing that really made my decision is that trainers, trialers, breeders, and fellow hunters that I know, respect, and trust have had their dogs vaccinated and many have seen the benefits firsthand. In the unfortunate event that LuLu gets struck, I’m still taking her to the vet. I’m just hoping that the vaccine buys me some additional time to get there. I commend you for opening the dialogue. Thank you Doc. This vaccine is aggressively marketed in my area of So. Cal. but in every case I know about where a dog has been hit by a rattler, it’s off to the vet for the intensive IV-based antidote. Don’t really see the usefulness of it. 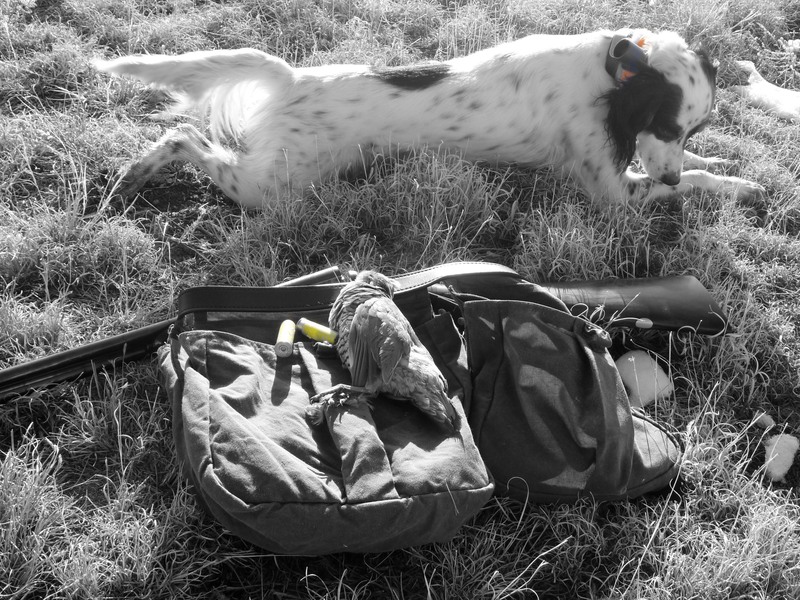 My antitdote–dog kept out of all likely snake areas until hard frosts hit in the hunting areas. I keep her conditioned during the off-season with daily walks on a roading harness and she has learned to really pull with it. Likelihood of seeing snake in the middle of a paved road is pretty low, Thank God! Finding a veterinarian that understands bird dogs at all is a challenge in my area. Most don’t know why I like to see a little rib showing or why I cut my setters hair. Most don’t understand conditioning of the canine athlete or why I want pups born early in the year. I have a lead on a new vet in the area that races sled dogs. Maybe she’ll be easier to work with. Sure wish you’d move your practice this way or I could move out there.